Do we really need to introduce who Mickey Mouse is? The mouse beloved by young and old was first created by Walt Disney and Ub Iwerkz in 1928 and made his first official screen debut as the leading character in Steamboat Willie. And Mickey and his friends, including girlfriend Minnie Mouse, dog Pluto (a mouse having a dog for a pet only happens in a cartoon) and friends Donald Duck and Goofy, have been entertaining and enthralling us ever since. Not only is the silhouette of his head (three connected circles reminiscent of a venn diagram) a recognisable motif, Mickey is also known for his trademark outfit - white gloves, red shorts and oversized yellow boots. A Danish brand known for their coveted customisable charm bracelets, the Pandora Disney winter 2018 collection consists of Mickey and Minnie charms, rings and open bracelets. They also have festive Christmas themed and bejeweled options. The Austrian brand famed for their use of crystals has also jumped in to create a series of items to commemorate Mickey’s birthday. You’ll find tastefully bling necklaces, bracelets, earrings, handphone cases and even Mickey and Minnie crystal figurines. 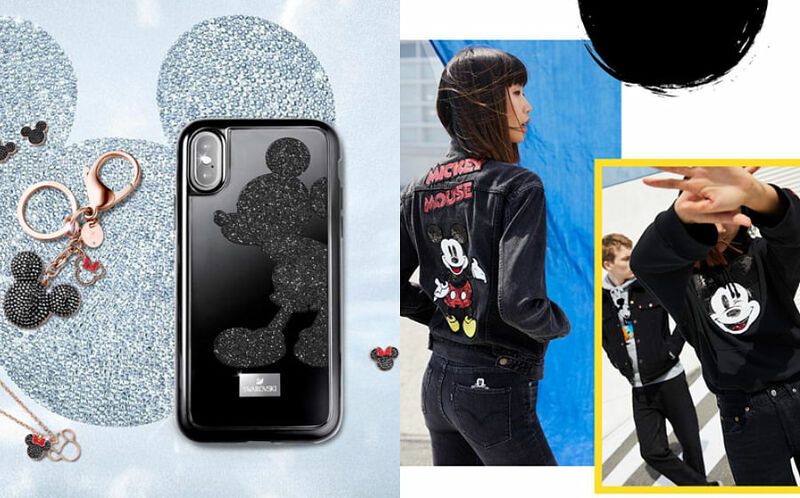 A fellow American brand that has also received widespread popularity, this collaboration between Disney and Levi’s includes their signature denim jeans, t-shirts, sweaters and jackets. We’re loving the sequins, flocking and embroidery techniques. Not only is 2018 the 90th anniversary of Mickey, it is also the 85th birthday of French athleisure label Lacoste. This partnership has birthed almost 30 products, including t-shirts, polo tees, jumpers, footwear and accessories that cater to all. Japanese fashion label Uniqlo is well known for their cool collaborations and they’ve partnered with Disney this year to create several collections themed around Mickey. Available for both sexes and kids, Uniqlo has partnered with different designers such as British graphic designer Kate Moross and the Andy Warhol Foundation for the Visual Arts for the collections. Local jeweller Poh Heng has created a series of rings, bracelets, earrings and necklaces that play with the silhouette of Mickey and Minnie Mouse. The elegant designs are in 18k white gold or 22k yellow gold, and perfect for those who prefer simple, minimalist designs.